One of the partners in my office told us about the chocolate truffles his fiancée makes — Oreo chocolate truffles. Why I never thought of trying that recipe myself, I don’t know. Who loves chocolate + Oreos more than me? So I set to work and created a super easy vegan version. 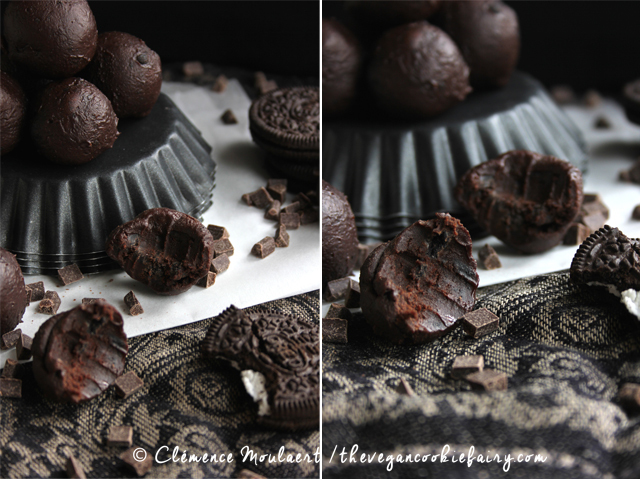 3 ingredients, 20 minutes hands on time, and voilà: creamy, irresistible Oreo chocolate truffles! If you do try this recipe, tag me @thevegancookiefairy on instagram or @clemcookiefairy on Twitter, and use the hashtag #thevegancookiefairy so I can see your vegan creations! But I’ve got more good stuff to share with you today — Just V Show are kindly offering free tickets to all my lovely readers for next weekend’s veggie-friendly show in London. Just visit this link to download as many free tickets (worth £10 each) as you like (!!!). I can’t attend this year as I’m busy in Edinburgh, but I want you all to enjoy the show if you’re in the city next weekend. ‘Nuff talk, more chocolate please. Smash the Oreos to pieces, either by hand or in a food processor. You want a coarse powder with larger pieces through it. Place a heat-proof bowl over a pan of simmering water. Add the chocolate chips and the coconut milk/cream to it and gently let them melt together, stirring occasionally with a wooden spoon. Fold in the Oreo powder, then set aside to cool before placing in the fridge for about an hour to set. When the chocolate has set, scoop up a teaspoonful and roll the chocolate into a small truffle size.You could make 15 medium-sized truffles, or 20 smaller ones. Store them in the fridge for up to a week – maybe more, but they’ve never lasted that long in my house! I love making chocolate truffles, so leave me your suggestions in the comments for what kind of chocolate truffle I should make next! About an inch across sounds like the right size – if it’s the snack pack I’m thinking of, there are 6 Oreos in a pack, right? The pack I use is the long tube one, weighs 154g and contains 16 Oreos.